We were out on Mill Road on Saturday and Sunday to raise awareness of what’s happening, giving out leaflets. The Mill Road campaign was mentioned in Thursday’s Guardian. A piece reporting on the Campaign will go out on Friday 28th September in the afternoon slot ‘Fridays’ from 3pm, on 209radio, on 105 FM. Tesco have submitted plans to move into Mill Road, Cambridge, one of Cambridge’s most cosmopolitan areas. A public meeting on Thursday 28th September attracted well over 200 people, demonstrating huge public concern for the future of Mill Road. A Committee and Subgroups have been set up. Please object urgently on the grounds for objection that we have identified. Although the date has now passed, we would still encourage people to write. The first public meeting of people concerned about the prospect of a Tesco store on Cambridge’s Mill Road attracted hundreds of people. There was much concern for the future of one of Cambridge’s most cosmopolitan areas if the proposed shop goes ahead. Several put their names down for the Committee being formed to co-ordinate action, and this website has been set up as a central point of information. Chris Hull from the campaign which managed to keep Tesco away from Unthank Road in Norwich came to the meeting on Thursday and shared the experiences he and his fellow campaigners have had there. This article syndicated from IndyMedia Cambridge. Tesco hope to move into Mill Road, Cambridge. The over whelming majority of residents and local traders absolutely do not want this to happen. The campaign against Tesco has well and truly begun. The rumours that supermarket giant Tesco are planning to open a store on Mill Road are now confirmed with Tesco putting in planning applications for a plant, atm and signage at the old Wilco site. The applications were submitted by Tesco in July but are currently “invalid” – that is to say, there was some problem with the application (possibly some essential information missing). The City council informed Tesco on the 31st July that the application was invalid and invited them to resubmit. They have heard nothing from Tesco since. Mill Road is an extraordinary street on which it is possible to drink Arabic coffee or fine wines; where you can worship in a Mosque, a Hindu shrine or a Baptist church; where you can eat foie gras or fish and chips, tom yum or chicken tikka lababda; where you can stock up on herbs and spices from aam to zedoary. Alternatively, the mega-chains create a one size fits all version of the world. Suffocating creativity and diversity where ever they go. Britain’s biggest supermarkets present a united front to ensure they’ve stitched up farmers, their workers and customers. Tesco already controls over 30% of the UK’s grocery market, they don’t need to come here, and we don’t want them. We need to stop Mill Road becoming like every other street in the country. Please consider joining the campaign, and come along to the open organising meeting. Let’s keep Tesco off Mill Road. Thursday 27th Sept: 7 pm: Libra Aries bookshop (9 The Broadway, Mill Road). The old Wilco site should be used to boost the local community not turn it into another identikit street. Tesco, keep your hands off Mill Road. It’s unique – and we’re going to fight to keep it that way. This article was published in the Cambridge Evening News on Wednesday 25th September 2007. SUPERMARKET giant Tesco has been told to stay away from Cambridge’s most cosmopolitan street. It plans to open a store in Mill Road in the next few months, but residents and traders are opposed and a group has been set up on social networking site Facebook called “Let’s turn Mill Road into Chains Free Zone”. A meeting has also been organised to drum up support for the campaign, and a poster advertising it says: “Tesco already controls over 30 per cent of the UK’s grocery market, they don’t need to come here, and we don’t want them. Emma Lindsay, 23, of Great Eastern Street, Romsey, has organised a petition and put posters in shops in Mill Road. Cambridge Liberal Democrats are supporting the protests – Romsey county councillor Alice Douglas said: “One of the best things about Mill Road is how diverse and vibrant it is. 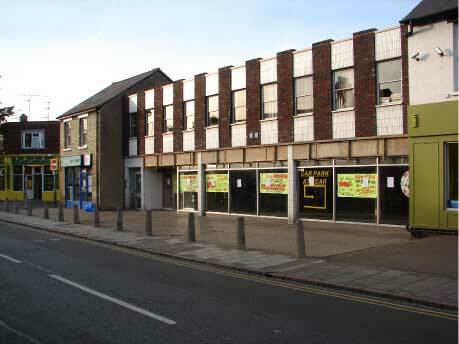 Tesco has agreements in place to move into the shop, but is waiting for planning permission to make amendments. The application for a new shopfront with ATM machine, new sign, and single storey rear extension were submitted to Cambridge City Council last week and a decision is expected on November 12. Jim Jepp, 37, of Fletcher’s Terrace, Romsey, set up the site on Facebook and is organising the protest meeting. Mr Jepp said he was hopeful Tesco could still be stopped – he said it was notoriously difficult to secure a drinks licence on the road, and he said if the planning applications to make changes were turned down, Tesco may change its mind. – The residents’ and traders’ protest meeting is being held in Libra Aries Bookshop, 9 The Broadway, Mill Road, from 7pm tomorrow (Thursday, 27 September). A CEN photographer turned up on Tuesday 25th for a photoshoot outside the Wilco site where Tesco plans to put its new store. This resulted in coverage in the Wednesday edition.